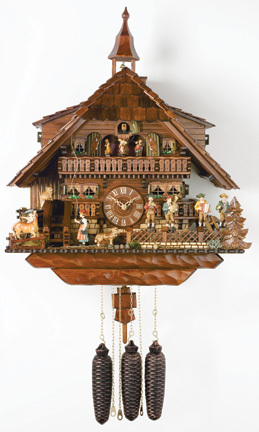 Our most elaborate eight day musical cuckoo clock will amaze and delight everyone. Beautifully crafted musicians file through the door under the little cuckoo as four more handsome musicians move side to side and a girl rings the bell. This clock measures 23" and promises to be a great conversation piece!